As the US army storms into Baghdad, Saddam Hussein's treasure leaves town secretly in lorry convoy, en route for Europe's banks across the hills by night. Awaiting the hoard's arrival eagerly in Venice is a motley bunch of conmen, hoods, card sharps and, inevitably, a London stockbroker, Patrick the Beautiful. In tow, playing his bridge innocently each night with the gang, is JOE, former British Intelligence agent and ex-banking supremo. Strenuous efforts are made to blackmail Joe, master of the adroit side-step, into joining the heist. But Joe has other ideas. Meanwhile in London, British Intelligence supremo ANNIE is embroiled in the Foreign Office's attempt to rig the succession at the European Central Bank. To her chagrin, she discovers that her preferred but incompetent choice to supervise Intelligence in Venice has very different ideas about loyalty and service. 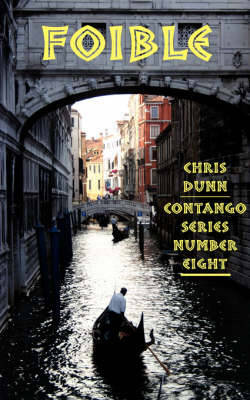 With massive consequences for Annie's career as the in-house betrayal begins...FOIBLE, no 8 in the CONTANGO espionage thriller series, boils to an astonishing climax as the Curse of Saddam's Gold simultaneously - and tragically - in London and Venice.